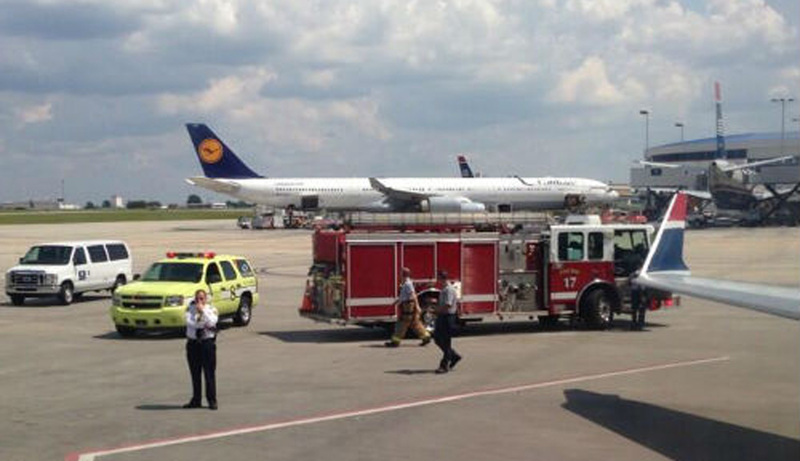 CHARLOTTE, N.C. A swarm of bees delayed a US Airways Express flight at the gate at Charlotte Douglas International Airport. The airline said Flight 2690 to Indianapolis had boarded Wednesday afternoon and was ready for departure. When the gate agent approached the tug, which pushes the airplane back from the gate, the agent noticed the bees. US Airways spokeswoman Michelle Mohr said a beekeeper arrived at the gate and captured the bees. Mohr said the 79 passengers and four crewmembers aboard the CRJ-900 left Charlotte Douglas at 4 p.m., almost three hours behind schedule. The flight arrived in Indianapolis at 5:16 p.m.
One passenger, Andy Jeffers, tweeted that a flight attendant came over the plane's PA system and asked if anyone was allergic to bees. None of the bees got inside the cabin of the aircraft, and no injuries were reported. CBS Charlotte affiliate WBTV reports the bees were circling the tug that pushes the aircraft from the Jetway. Jimmy Odom of the Mecklenburg Beekeepers Association was called to the scene to remove the bees. Odom told the station the airport is concerned sometimes that flights from the tropics may bring back Africanized honey bees, better known as killer bees. However, that was not the case this time - the honey bees were swarming on the tug as the queen bee searched for a new place to build a hive.